When I was a kid I loved banana popsicles. Not the all-natural banana popsicles, but the artificially flavored and colored, tastes like a banana Runt, banana popsicles, specifically these. Now as an adult, I have a more sophisticated taste and like I said, am trying to do more of the homemade thang. So popsicles made with real bananas, covered in rich chocolate, rolled in crunchy toppings, now that’s a banana popsicle I puffy heart love! I don’t know whoever thought to cover fruit (strawberries, bananas, apples) in chocolate, but it is the most sinfully pleasing, makes you feel less guilty for devouring chocolate, snack ever. While the concept is simple, the possibilities are endless. 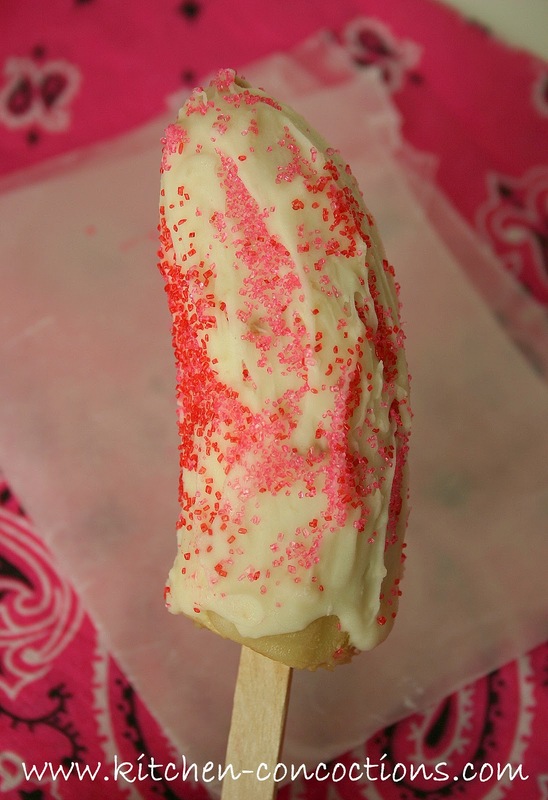 My banana pop pictured is simply white chocolate and colorful sprinkles, but take note of some of my suggestions below and go crazy with your frozen banana pop concoctions! 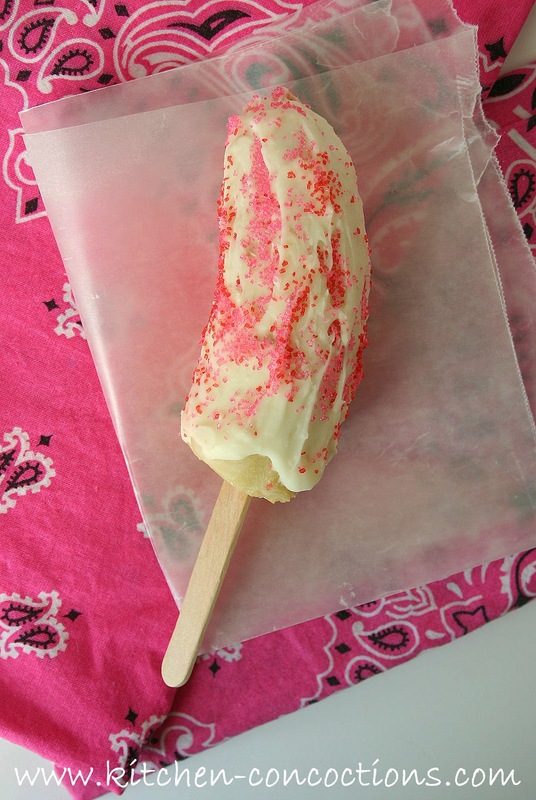 Insert popsicle stick into banana halves. Place on baking sheet lined with parchment/wax paper. Freeze for 3-4 hours or until frozen solid. Place candy melts/chocolate in microwave safe bowl. Microwave on medium-high heat for 30 seconds. Remove and stir. Microwave again for 30 seconds and stir until chocolate is thoroughly melted. Dip frozen banana popsicles in melted chocolate, completely covering the entire banana. Dip chocolate covered banana in desired toppings. Place dipped banana on lined baking sheet. Repeat with remaining bananas. Place prepared bananas back into freezer and freeze for 3-4 hours or until frozen. Serve after freezing or place in freezer safe packaging and store in freezer. My kids love frozen chocolate bananas! We haven't made them in awhile, though – I should take some of your suggestions and make them with my kids again!